"I believe people are put in the right place in the right time"
In this Oct. 18, 2018 file photo provided by the Arizona Department of Public Safety is the scene where authorities say they rescued a seriously injured woman who spent six days in the desert after crashing her car near Wickenburg, Arizona. A woman spent six days in the Arizona desert after her car veered off a highway, surviving injuries from the crash and getting rescued after roadway workers noticed a broken fence, authorities said Wednesday. The Department of Public Safety said two state transportation workers and a rancher were corralling a bull on the other side of a fence along a highway on Oct. 18 in the town of Wickenburg, about an hour's drive northwest of Phoenix, when they saw the fence was unusually damaged. 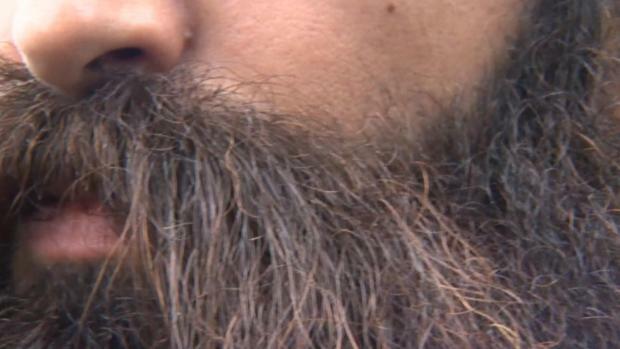 "I said, 'There's tracks right off the edge of the road through the fence," Zach Moralez, a highway operations technician, told The Associated Press. "I said, 'Hop over that hill, I bet you there's a car down there." 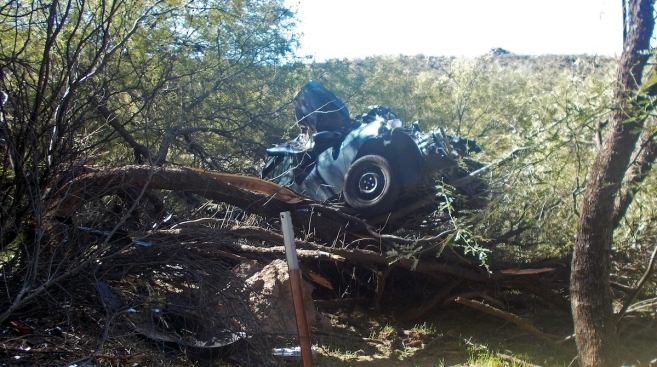 The three saw a mangled car entangled in a mesquite tree, made their way to the bottom of the hill and checked the car. It was empty. Nobody answered their hollering, Moralez said. A DPS trooper arrived, and by then, other members of a maintenance crew showed up. They all fanned out. Moralez said his brother, the rancher, spotted a footprint. The group followed the tracks for about 500 yards (457 meters) and found a 53-year-old woman severely dehydrated and with serious injuries in a dry riverbed. "She was in the fetal position, and there was no movement," Moralez said. "We started asking her a bunch of questions: 'How long have you been here? Do you have any pain?'" Despite being somewhat lethargic and in pain, she was alert enough to open her eyes and answer questions. Moralez said she was dirty from sleeping on the ground for a couple of days and had facial trauma — likely from the accident. She was airlifted to a hospital about 15 minutes later. The woman recounted how she was driving on U.S. 60 on Oct. 12 when she lost control of her car, according to the trooper. The vehicle went through the fence and dropped 50 feet (15 meters), landing in the tree. She stayed inside her car for several days before trying to walk toward some railroad tracks to find help, but she was too weak to make it, authorities said. DPS spokesman Quentin Mehr said the woman is declining all media requests and did not give any details about her current condition. DPS Director Col. Frank Milstead commended the transportation workers and the rancher. "Due to their outstanding efforts, this woman's life was saved," he said in a statement. Moralez said it's a good feeling to know that he helped make the difference between life and death for someone. "I believe people are put in the right place in the right time," he said.